The idea that we might be robots is no longer the stuff of science fiction; decades of research in evolutionary biology and cognitive science have led many esteemed scientists to the conclusion that, according to the precepts of universal Darwinism, humans are merely the hosts for two replicators (genes and memes) that have no interest in us except as conduits for replication. Richard Dawkins, for example, jolted us into realizing that we are just survival mechanisms for our own genes, sophisticated robots in service of huge colonies of replicators to whom concepts of rationality, intelligence, agency, and even the human soul are irrelevant. 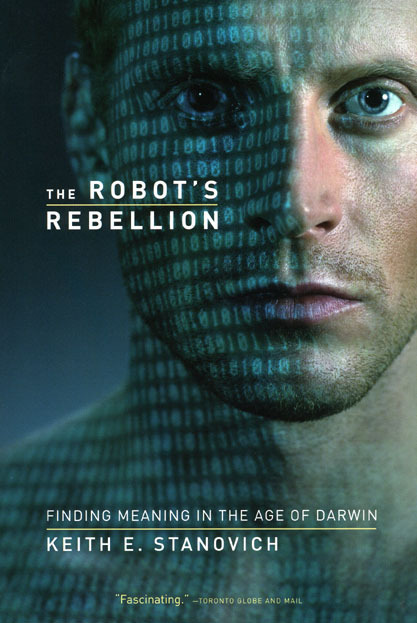 Accepting and now forcefully responding to this decentering and disturbing idea, Keith Stanovich here provides the tools for the "robot’s rebellion," a program of cognitive reform necessary to advance human interests over the limited interest of the replicators and define our own autonomous goals as individual human beings. He shows how concepts of rational thinking from cognitive science interact with the logic of evolution to create opportunities for humans to structure their behavior to serve their own ends. These evaluative activities of the brain, he argues, fulfill the need that we have to ascribe significance to human life. We may well be robots, but we are the only robots who have discovered that fact. Only by recognizing ourselves as such, argues Stanovich, can we begin to construct a concept of self based on what is truly singular about humans: that they gain control of their lives in a way unique among life forms on Earth—through rational self-determination. What Kind of Robot Is a Person? Whose Goals Are Served by Our Behavior? Your Genes Care More about You than You Should Care about Them! Processing without Awareness: There are Martians in Your Brain! Try It Yourself—Can You Override TASS in the Famous Four-Card Selection Task and the Famous Linda Task? Evaluating Rationality: Are We Getting What We Want? The Dangers of Positive Thinking: TASS Can’t "Think of the Opposite"
Can Evolutionary Psychology Rescue the Ideal of Human Rationality? Would You Rather Get What You Want Slowly or Get What You Don’t Want Much Faster? The Panglossian’s Lament: "If Human Cognition Is So Flawed, How Come We Got to the Moon?" Which Memes Are Good for Us?